Today my blog is one year old! I can’t believe it’s already a year since I started this blog! On the one hand it feels like I just recently started this blog and on the other hand it feels like I have this blog for so long already. I love blogging and I met so many awesome authors and bloggers during this year. And I am so gratefull for all of you who follow my blog. It has been an amazing year! And I am hoping the next year will be just as good or even better. So to celebrate my one year blogoversary there is a giveaway! All prizes are donated by awesome authors and the rafflecopter has options to follow them and to follow my blog. Thanks a lot to all the awesome authors who donated prizes for my one year blogoversary and made this giveaway possible! There will be 23 winners in total! And all prizes are international! So go enter the rafflecopter! I’ve been blogging for more than a year… I also love blogging, but sometimes life gets in the way and I don’t have as much time as I’d like to. I was lucky to find a great blogging partner who helps me with posts and reviews. Thanks Oana! I get what you mean sometimes life gets in the way of blogging and I certainly had some weeks with not a lot posts due to that. Aw happy one year Lola!! That’s awesome. Hope year two is even better!! Happy Blogoversary Lola! I’ve got my first year celebrations coming up on the first of January too. Thanks a lot :). That’s awesome to hear you also almost reached the one year milestone! It certainly feels special to realize I have been blogging for a whole year now! I won’t enter as I already own some of these prizes, but wow: what a great list of good you have on offer. And, of course: Happy Blogoversary! Thanks! You can always enter and if you win a book you already have gift it to someone else. And indeed there are a lot of great books on that list! I am so thankfull to the authors who donated the prizes, without them I wouldn’t have been able to do a giveaway! Happy Blogoversary!! 😀 One year is awesome!! Your giveaway rocks – authors are amazing – and thank you for helping me out with my one year in September! Thanks Myra! Reaching the one year feels amazing! I am so glad all these authors donated prizes, authors indeed are amazing! Congratulations on 1 year!! I’ve been blogging for 3 years, and loved every minute of it! Thanks! I am hoping to reach the 3 year over 2 years too! So far I am loving blogging, so I certainly plan on doing this for a long time to come. I hope I never get bored of blogging! I really love blogging and while it’s a lot of work, it’s also a lot fun! And indeed there are so many nice people I met thanks to blogging. And reaching that first year milestone feels huge! Congrats, Lola! Happy Blogoversary =D. I’ll have my one year blogoversary in March! Crazy! Congrats on your 1 year blogoversary, that is an amazing achievement! I’ve been blogging for 1.5 years and it’s really fun 🙂 Enjoy and thanks for the awesome giveaway. Thanks Jeann! Reaching the one year feels so awesome, although I suspect every year mark after that will feel just as great! Thanks Dre :). The one year really feels like a big achievement! I’ve been blogging for about a year myself.. January will by my one year anniversary as well. Congrats on your milestone!!!! What a happy one at that! Eep! Your one year blogoversary is close too! Happy HAPPY blogoversary! *throws confetti and earl grey tea leaves* Hugs to you! I hit my one year in Feb of next year! So excited love book blogging and I have meet so many great people! 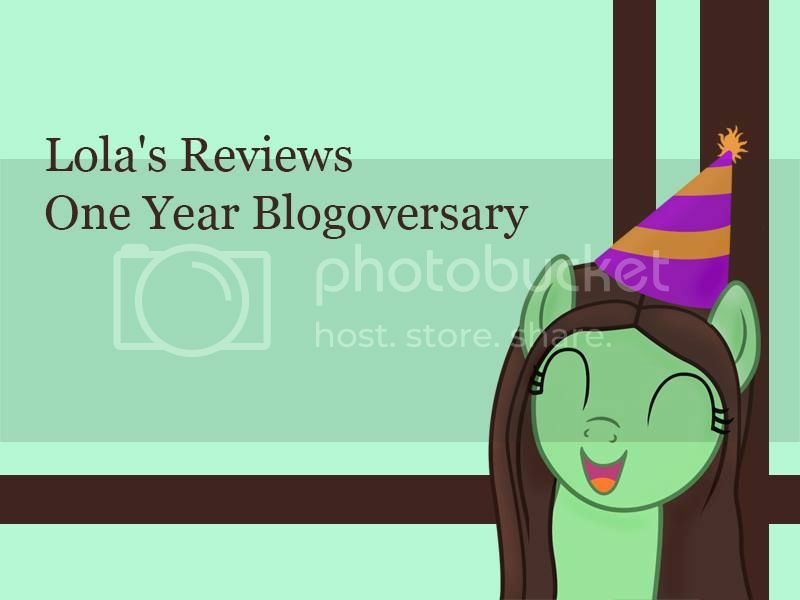 I’m a little late, but happy Bloggiversary!